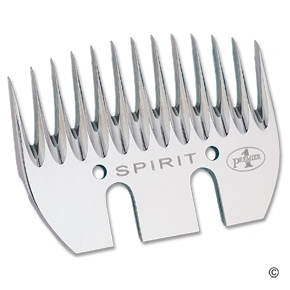 The Premier Spirit 13 Tooth Comb is similar to the Heiniger Ovina Comb, Sunbeam's Pacer and the Oster P1082. Very popular comb for moving through wool quickly and safely! For use with Premier 4000S Shearing unit. Also works on Oster Shears and Lister Shears. It all started with our love for llamas and alpacas and a need to find products that work for these wonderful animals. Today we're proud to provide quality products direct to your doorstep through an experience you'll enjoy. And most of all, we hope you'll enjoy the products as much as we do. Copyright © 2014 Useful Lama Items, Inc.. All Rights Reserved. Ecommerce Software by Volusion.